Note: Initiation Orders can only be placed by authorized DPA Chapter Representatives or Department or Program Chairs. Individual DPA members can order honor cords, replacement pins and certificates here. 1. Faculty Advisors Determine Eligibility at their local institution, conforming to national standards. 2. Faculty Advisors send the names of qualified members to the national office electronically. Students or chapters may also elect to order honor cords at this time. Students may order their own honor cords independently at any time. Email form directly to caltmeyer@washjeff.edu Payment is sent separately at a later date! 3. National Office mails certificates and cords to chapter advisor who conducts an induction at a pre-arranged time. Membership (regular or honorary-lifetime membership fee)Includes custom, embossed certificate and membership pin. $25 p.p. Double Braided Honor Cord $10 p.p. Initiation times and dates are determined by the individual chapters. A copy of the “DPA Ritual” guidelines serves as a template for the initiation, but individual chapters determine their own details. 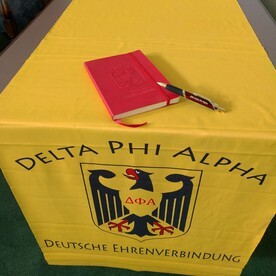 Chapter advisors may order the initiation kit including a flag, book, and pen in the online store. Individual DPA members can order honor cords, replacement pins and certificates here.